Harry Basil Feneron was born in London on 14 May 1920, the older of the two sons of Harry and Edith Feneron. His father ran an electrical business, where he and his brother both worked after leaving school. 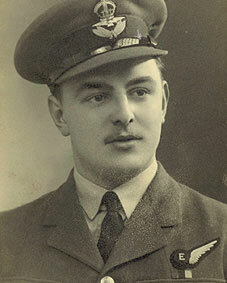 Feneron joined the RAF in 1940 and served in ground crew, before taking the opportunity offered in 1942 to train as a flight engineer. He qualified in October 1942 and was then posted to 1654 Conversion Unit, where he joined up with Ken Brown and his crew. He would go on to fly with Brown for the rest of both their operational careers. The crew were posted together to 44 Squadron on 5 February 1943 and completed six operations between 9 and 27 March. They were then posted again as a unit to 617 Squadron on 29 March. The relationship between Brown and Feneron was closer than it was between some of the other pilots and flight engineers on the Dams Raid, with Feneron having more like an assistant pilot role. In the low flying training before the raid, Feneron did an important job looking out for high tension wires and other obstacles, calling out to his skipper as soon as he saw them. They split the responsibility for forward vision, with Feneron taking the starboard half of the windscreen and Brown the port side. This spirit of partnership could well have been the reason why they survived the testing low level flight to the Dams and back, while others didn’t make it. Feneron saw Burpee’s crash and afterwards concluded that they had been shot down because they weren’t low enough. When they reached the Sorpe Dam, he worried that if they rose too high after their attack they might fall prey to a night fighter. However, none arrived and after dropping their mine the crew of AJ-F set course for home. Their route took them past the Möhne, where they were shocked to see the damage caused earlier in the night. They then nearly came to grief on two occasions, near Hamm and at the final obstacle, the Helder peninsula on the coast, where Feneron crouched on the floor as Brown flew as low as he dared. When they were safely over England, Brown handed over the controls for a while to his engineer while he went aft to examine the extensive damage which AJ-F had endured. He was back in the pilot’s seat in time to land at Scampton and Feneron went through his customary ritual of kissing the ground – on this occasion probably with more fervour than usual. He was then able to see the damage for himself, including a large hole a few inches behind where wireless operator Herbert Hewstone had been sitting. Feneron went on to fly on nine more operations in 617 Squadron before being commissioned and then in March 1944 being transferred into a training unit. He carried out various instructional roles for the rest of the war before being demobbed in 1946. He returned to work in the family business in London, where he stayed until he retired. Basil Feneron died on 18 November 1993 at his home in Gerrards Cross, Buckinghamshire, where he had lived with his wife, Jean, for 30 years. He had two children. Thanks to Mrs Jean Feneron for help with this article. I’ve just seen the Dambusters programme on TV 29 December 2015. I knew Basil well and did business with him in the eighties. He was a visionary. We developed one of the first plastics shower cubicles together. Life was never dull with Basil! What a wonderful man. I was always proud to have been his friend and never more so than now having seen the programme. He often talked about Jean and we had planned to meet one day but that never happened. Basil knew my wife Hilary. Best wishes to any of the family who are still around.